Hi everyone! Thanks so much for voting for my tank! And congrats to the other great tanks I had for competition! It seems fitting to have won in June’s TOTM because this month marks my one year of fish keeping. It’s exciting and an honor. My name is Hannah and, as I said before, I’ve been fish keeping for a year. My family had a couple tanks when I was growing up but they were not very in depth, so I don’t really have a background in aquariums. However, I do come from a family of nature geeks and animal lovers, so it was only natural that I would follow suit. So my journey started last summer (2016) when a family member was cleaning out their attic and gave us some stuff, including their son’s old tarantula tank. It was a 20 gallon long and I was super excited about it’s potential. After doing lots of research and going back and forth, I decided on making it a fish tank. I properly cleaned it and got all the supplies, equipment, plants, driftwood, and finally fish. I did so much research the first few months I had the tank and learned so much. I became obsessed! I stocked it with random plants from petco, bloodfin tetras, panda corys, and a nerite snail (in that order). It was very low tech with only a HOB filter and a heater. I was so proud of it LOL. I quickly decided I needed an upgrade though and got a larger tank as a Christmas gift. 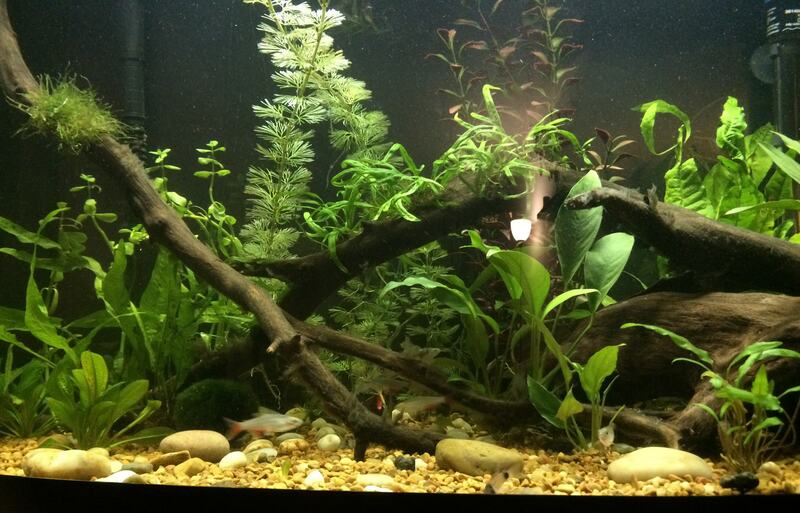 It cycled quickly and I added everything from the old tank plus more driftwood branches and plants. 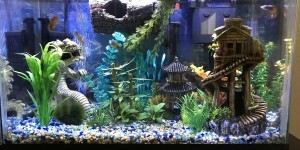 I could see how much happier my fish were as they swam all around their new digs. I could see the fish so much better with the added light. I fell in love all over again! So, onto the real Tank of the Month winner! So this tank is 7 months old. The equipment has stayed the same but the inhabitants have changed and fluctuated a little. I love them all. They all get along and have their own little antics they get up to. The bloodfins are so active and I love watching them. They are very dramatic and freak out at any change in the tank. My corys are my pride and joy. 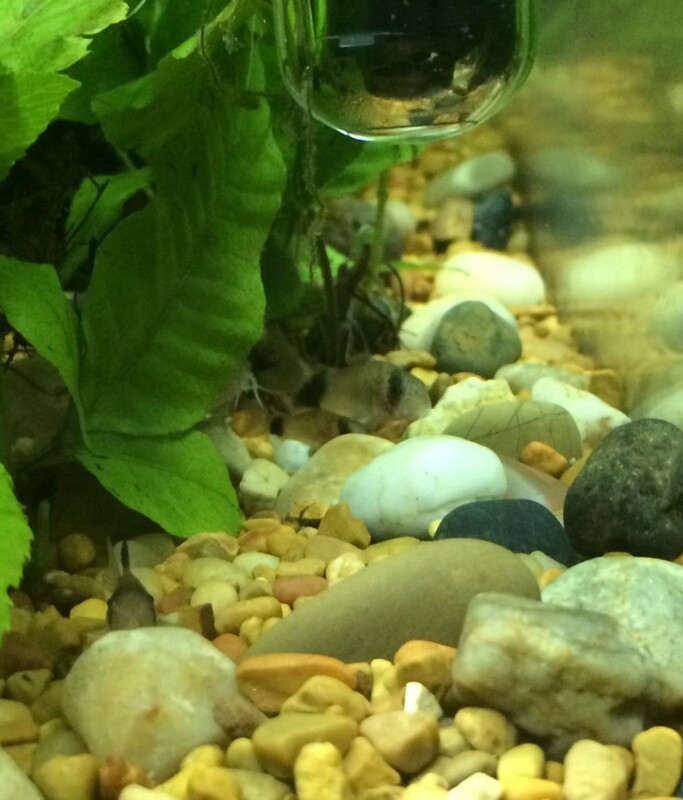 They were breeding for a short while and I was a proud fish grandma. Only one fry managed to survive, but their little family grew and I’d love it if they were to breed again. My two nerite snails are super lazy and do nothing but poop and lay eggs all over the driftwood. 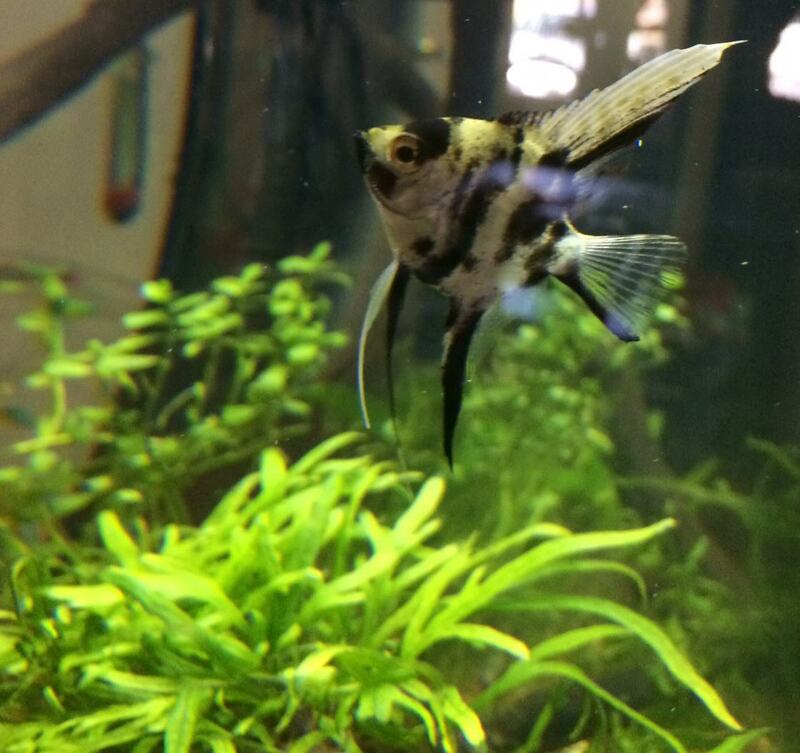 My little angelfish is your typical angelfish with lots of personality. He(?) is always the first to check out something new, swim up to the glass to greet someone, and greedily swim to the surface for food, even if I’m only pouring in Excel. 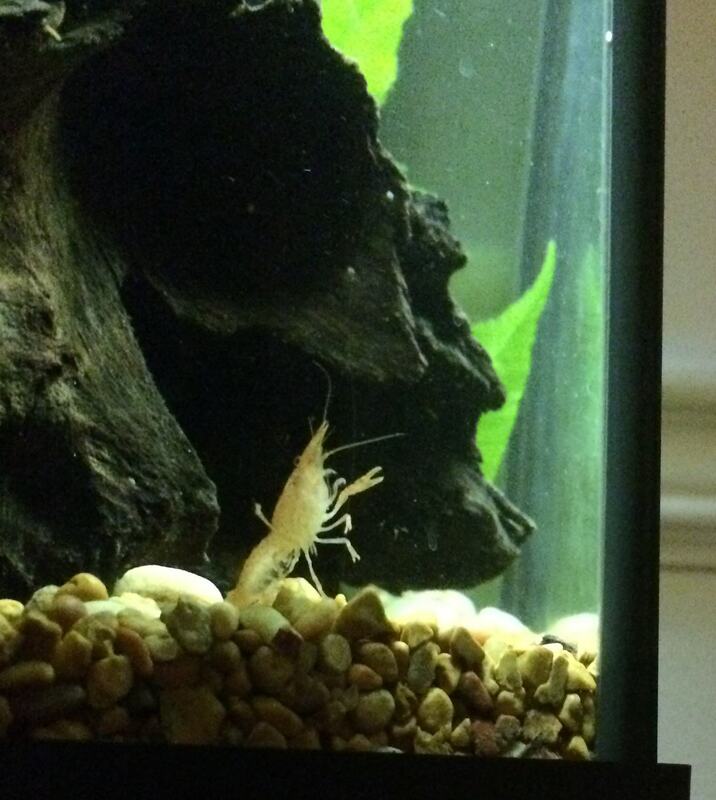 My two newest additions are some ghost shrimp. They’re cool little buggers, I love their little swimmer legs. They’re good at blending in though so I haven’t been able to observe them much. 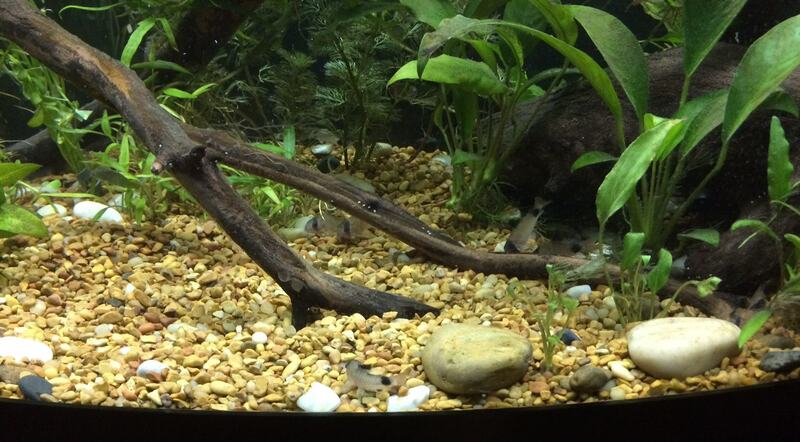 Feeding: I feed the fish every night, and Sundays are their fasting day. They are fed a variety: flake food, veg tabs, shrimp tabs, blanched shelled peas, frozen bloodworms, and frozen mysis shrimp. Plants: Plants are my real passion in the hobby, though. I have many plants above water, but aquatic plants were and still are a brand new thing for me! I’m still learning but have an ok grasp of what I have. I did have one plastic plant to give the composition some height before the cabomba grew in, but I’ve since taken it out. There also used to be a Marimo moss ball but it seems to have disappeared…? Maintenance: I dose my plants with Flourish Excel liquid carbon daily. Weekly, I do 50% water changes, vacuum the gravel, scrub the glass as needed, and spot clean anything else. Once a month I use the old water to water my house plants and garden ? Every couple months I rinse out the filter media and dose osmocote tabs (though that is happening less often). Fairly low maintenance but I am diligent, and every week brings a new adventure (good or bad)! 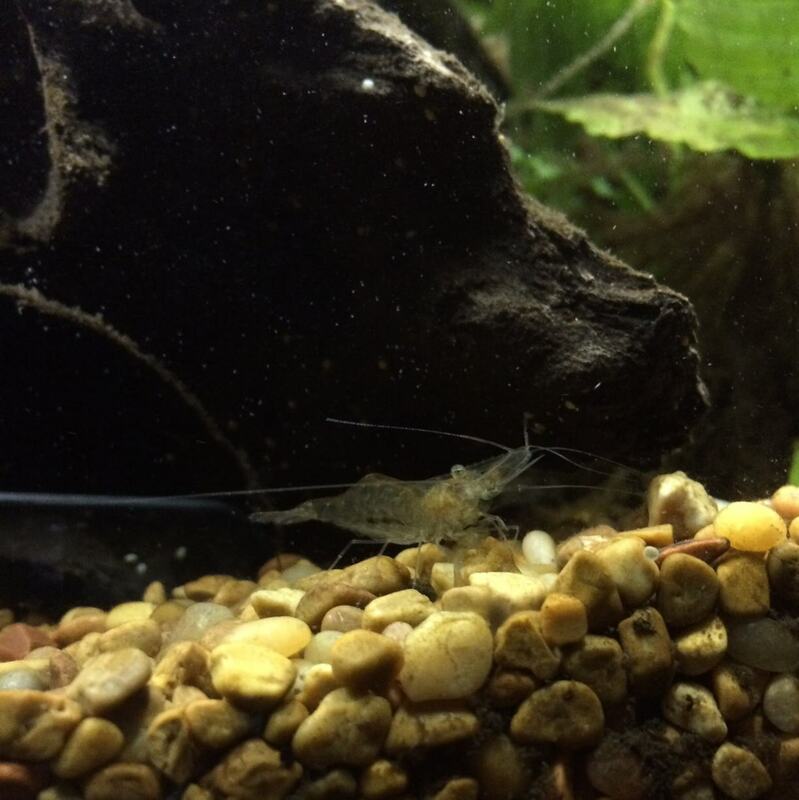 Conclusion: My long-term goals for my aquarium are to implement a CO2 system, get lush plant growth with more uncommon and advanced species of plants, possibly get more shrimp, and to get my corys to breed again. And to somehow find a way to keep cat hair from getting in the tank (it’s a never ending battle). That’s about all I have to say about this tank so I’ll stop here before I get rambling more. Thank you everyone again for voting for my tank! It’s an honor and was a lot of fun! Filed under Featured, General Articles, TOTM.